Unfortunately it seems very hard to get train tickets from the adresses given on seat61. Guests from us have used both addresses since summer 2012 and were satisfied. Of course Aswan Indivdiual does not accept any responsibility, credere liability or any other claims whatsoever. These links are only to give advice. Service from e7gezly.com is very good and efficient. I first booked Cairo-Luxor tickets as a trial. There were a couple of problems in the first ticket but these were sorted out by them very quickly just by responding to my emails. I got my ticket as a pdf file by email on the same day. So, I booked the second tickets Aswan-Cairo yesterday evening and I received the ticket pdf file by email today morning. You need to observe a few critical things and everything would go smoothly. I give these below so that it would help others who want to do similar bookings by sleeper trains. 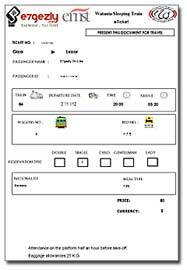 The booking process is fairly simple: Choose the date, from & to, select the train, number of persons in single or double cabin etc. and do not forget to click ‘foreigner’ and give country. (I put in the names of both me and my wife and it took them.). Do put Mr/Mrs/Miss ahead of the name as it appears they need to know Male or Female. Field 2: Your phone number. It would accept only numerical digits and this has to have a minimum of 10 digits. I put 0044 ahead of my UK mobile (10 digit number) and it accepted it. Put your identification document number (for example passport). I am told this will be examined by the conductor to confirm the identity. I put passport numbers of us both and it did take it. Field 4: Your email address. First you will get an email acknowledging your reservation request and after a few hours, you would get the ticket as a pdf file. The ticket will have wagon number and berth numbers. This ticket is to be printed and taken with you for the travel. Field 6: City: I gave city, post code & country and it took it. If you are paying by credit card, it appears it should be enrolled for a security process for online purchases. I used MasterCard that is registered with SecureCode. Like many other purchases you do online, the process will take you to the page of your bank with the SecureCode (or any other like Verified by VISA) and you need to enter your security code details as asked on that site. Then, no problem, the payment goes through. But you do not get any message at all. The page just closes. You would get an email very soon acknowledging your request and containing the reservation request as well as your personal data. Then after a few hours you would get your ticket as pdf file. Please check this carefully and if some things is not right, email them and they would correct and send you a revised ticket. In our case, for the first booking they sent me the wrong ticket (in someone else’s name), then sent me my ticket but booked by them by the wrong train and finally the correct one. Their response by email is very good and I did not have to phone. I think a guest has earlier made a comment regarding the security code saying this is not the 3 digits on the back of the card. You do need to enter the 3 digits on the back of the card on the payment screen, but the secure code is something that you enter after that. So, everything seems fine and we have our tickets. I hope our names would be there on the charts on the train and the journey would be good and hassle free. But we shall know that only in April 2013 and I shall then send further feedback. Thank you Girish so much for taking your time and write all this down as a help for future travelers. "1. When they ask for a mobile phone number, you have to give the number without countrycode. Only with one Zero in front. It doesn't make sense, but it is like this. 2. With payment of MasterCard they ask for a Secure Code, which is differet than on the back of the credit card. I did not have one. But you can - after answering several questions - ask for a new code. I did this and waited for an email that did not arrive. When I tried again the next day I had a closer look and saw that you have to invent any code and type it in. This worked!" For train sleeper train tickets, I used https://e7gezly.com/sleepingtrains/. 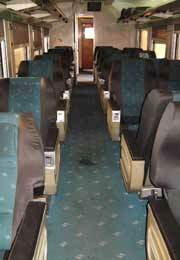 Being dedicated to sleeper trains only, the site is simple and clear. The site uses a combination of buttons and drop-down boxes to record choices. The text in drop-down boxes is gray. This doesn't mean the option is not available; they just chose to use gray text and a selection can still be made. I have read some comments on other web pages about couples traveling in one compartment and the need for them to produce marriage contract/licenses. On the e7gezly website under 'Rules, general' only Egyptian couples need to present a marriage contract. 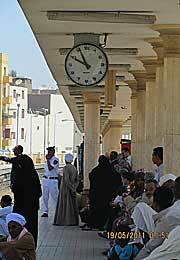 I selected an overnight train from Giza to Aswan. There was one odd thing that caused me concern. The web form required me to make a selection for train number and I was given only one choice, Train 86. I was concerned because Train 86 does not run the route I wished to take. In fact Train 86 was the only choice no matter which cities were chosen. I selected 86 and pressed on with the application and made my payment with VISA card. Payment went through and I was quickly sent an email receipt with a comment that I would receive tickets in two hours. Two hours and fifteen minutes later, I received another email. The content looked like the same receipt as in the first email... There was even a comment that I would receive tickets in two hours. Looking a little closer, I noticed a PDF file attachment. I had my ticket, after all. This took only 2:15 hours and I placed my order on a Friday at 2015. My train is 84 and not 86. I did not book a return trip. I will do that at the train station. https://enr.gov.eg is a good site for looking up train schedules. I did not try to book through them. I did make notes of train numbers and times so I know which train I want when on the days I decide to use them. The web form requires dates to be entered this way: dd/mm/yyyy. My first visit was flawless. When I revisited the site, the drop-down boxes were blank and I could not select cities. is not a travel agency but a platform to contact a network of great locals offering their services. 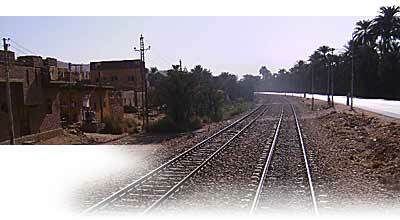 There are no prepayments taken and therefore it is not possible to book train tickets with Aswan Individual.